DougTrails! | A survivor promotes TBI recovery and awareness across the USA by bicycle. I believe that doing science is more than merely the pursuit of understanding the natural world. A scientist, researcher, or investigator often happily seeks to travel close to the edges of our known world for even the smallest alteration of his perception of what is true. Deep in thought, I carefully walked along the edge of land and water, atop a stone wall that attempts to retain the Schuylkill River’s flow of water molecules. It is exhilarating to balance between the safety of the land and the uncertainty that ‘rests’ in the river’s muddy current. Peering down at my bipedal devices of locomotion (feet), my view was one of comparison; soft grass on my left, hard rock and cold water to my right. As a scientist so often does, I compared the two, with my eyes, with my ears, and [wonderfully] with the feeling on the inferior surfaces of my feet. I recognized at that moment that my role as wall-walker (and research subject) was to act as an excited, ambitious, and altruistic example of how we all can push toward the edges of our realities and pursuits. I may have traveled, in my pursuit of truth, a bit further than the inches that separated me from the deep, flowing water below… but there are many more miles to crawl before we put this pursuit in the textbooks. You don’t have to walk on a wall to pursue science… All you have to do is test. Please read on about my most recent, edge-expanding adventure. Ever since I began to make sense of what had happened to my brain, I knew that science and understanding was in deficit. It owed something to me. I cannot begin to imagine the pain and fear that my family must have felt when the highly-skilled and knowledgeable neurosurgeons who cared for me told them, ‘If he awakens, he will likely be a vegetable and/or his life will be significantly disabled.’ This couldn’t possibly be true, they must have thought. Fortunately, it wasn’t. Like an oil-rush entrepreneur might have said, ‘There’s oil in them hills!’, I similarly report, ‘There’s passion in these neurons!’ Since awakening, I’ve been passionate to regain my life, my relationships, and my future. Interestingly, since we’re all connected and guided by our former selves and experiences, it should come to no surprise that my passion continues to be led by the trauma and emotional re-routing that occurred on May 31, 2006, when I sustained diffuse axonal injury to numerous regions my brain resulting in weeks of coma and months of hospital care. This past Wednesday, part of my passion’s goals were realized in helping research better means to give prognoses at to whether one will awaken from coma, and to what extent we can see recovery. I feel that anyone working on this topic is alright in my book! About a month or two ago, I received a curious email from Harvard Research Fellow Dr. Brian Edlow, who summarily wrote, “I may have an exciting research opportunity for you.” Or, perhaps that was all I really needed to hear. Before I even thought of questions to ask this doctor, I decided that I would disregard the strenuous travel time, schedule reorganization, and MRI discomfort I would be subjected to… and unequivocally say yes. The details were even more exciting than the premise! (I lucked out!) Dr. Edlow is currently working to help determine better means of predicting exactly who will or will not awaken from traumatic coma, and has been given the opportunity to use the most advanced tools possible. I was most excited about how he has been given the ability to use the Siemens Connectom scanner as part of the study. Science truly seeks to use that edge-finding ability as often as possible. A new example? You may remember the Human Genome Project from a a little over 10 years ago. In it, scientists all over the world sought to catalog all of the genes that make up the human genome, which, perhaps, would determine exactly why certain people are the way they are. Lately however, a new idea has come about, citing the brain’s connections and ‘wiring’ as the other puzzle piece. And the machine they use? Well, it pumps out absolutely breathtaking images of the brain like the one you see here. The Connectom, a Diffusion Tensor Imaging MRI Scanner that, apparently, is the only one of its kind. It has the ability to track the diffusion of water molecules in the brain, allowing scientists and doctors the ability to truly ‘map’ connections. Gave me jitters! Fast forward. My trip up to Boston this past Wednesday was simply momentous. All the stars aligned properly for my trip, which allowed me to take an Amtrak Acela train from Philadelphia to Boston. Five hours later, I was in Boston meeting with the Edlows and having a wonderful time. Dr. Edlow spent some extra time filling me in on the procedure I would be undergoing, which was absolutely invaluable to me. The work he is doing for brain injury treatment and care will yield life-changing results, I can attest. He recognizes that the brain’s structural connectivity, paired with MRI imaging, may be the key to developing expectations, procedures, and outcomes for those sustaining brain injuries. 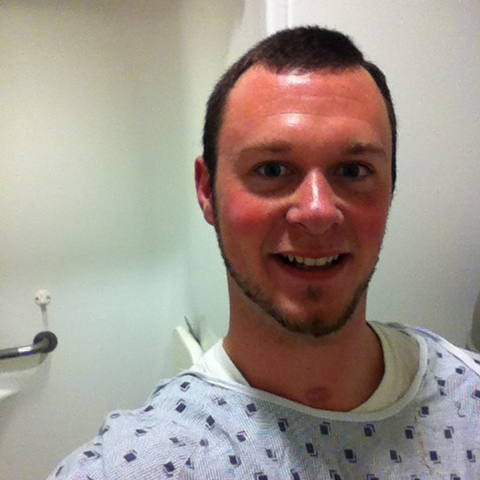 My MRI experience was actually very enjoyable. The Connectome scanner? I was quite nervous, it being my first MRI scan while conscious. What if I move too much? Would the long scan sequence be cancelled if I moved? Would it have to be restarted? These questions kept me outrageously still for my first scan of the day. I must say though, the machine was rather comforting after a while, the hums and record-scratch-type noises it emitted at regular intervals. Being as musical as I am, I wanted to develop rap beats to the sounds… but I kept losing my train of thought instead. I thought about anything and everything, all while knowing that there were doctors actually watching me think. Huge success! 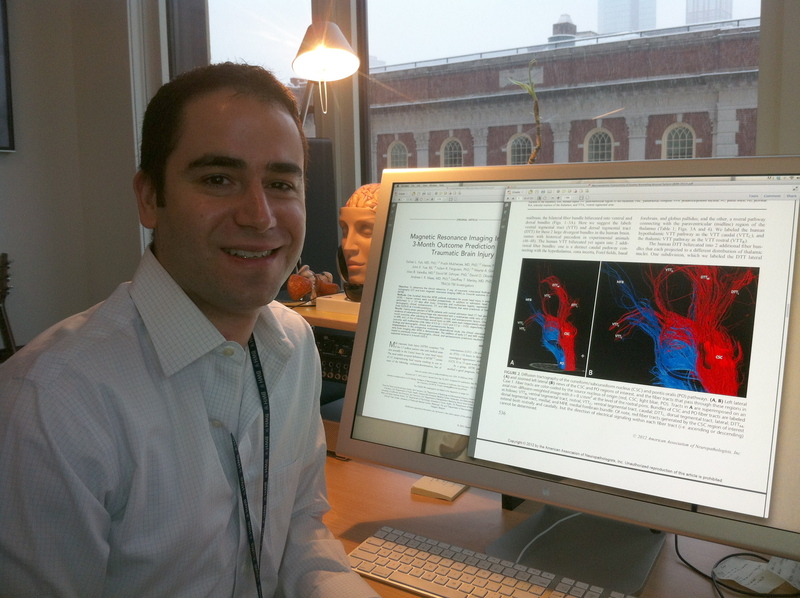 Due to the fact that these scans are part of an ongoing research project, I couldn’t include a photographed image of one scan of my brain, as I reviewed it with Dr. Edlow (I smudged it). This, just a short 10 minutes after emerging from the scanner’s ‘tube’, revealed tiny evidence that I’d sustained a brain injury. 7 years later. 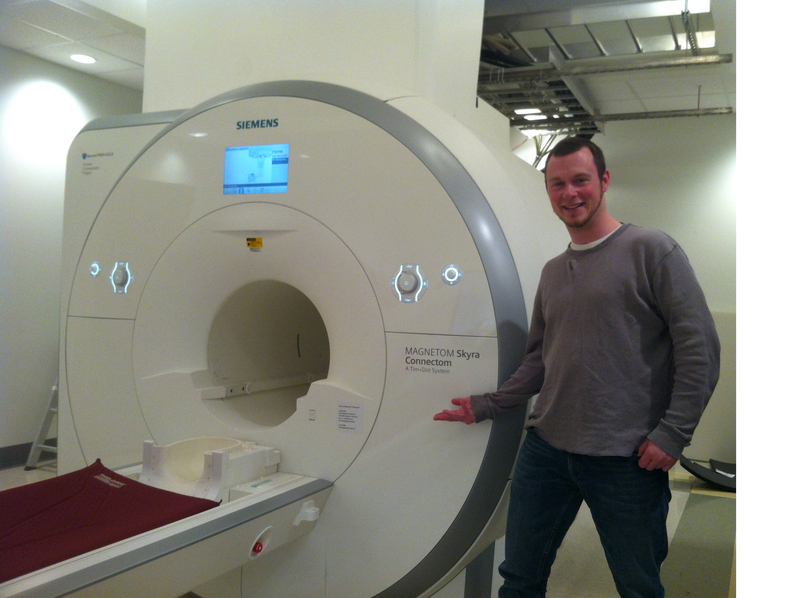 I also spent time in the highly-powerful 7-Tesla MRI scanner that afternoon. This machine, so immensely powerful that even small pieces of metal would destroy it, is also a wonder to have the brain scanned with. The titanium plates in my arm nearly cancelled the scan, too. After my “tube-time” in this rather noisy machine, I was very anxious to see the results. After all, this machine is nearly 5 times more powerful and precise than a standard MRI scanner you might see at a hospital. The scans, without using too many words here, were unbelievable! I cannot wait to someday share these images with family, friends, and other survivors. I believe Dr. Edlow was pleased with them as well. I am honored to have been invited to help pursue scientific knowledge about the human brain after it experiences severe trauma. I still feel that science owes me, but a tiny bit less than I did before. I’ll continue to walk on walls, believing that we all can sustain the notion that we are on the verge of something life-changing… And it is a simple notion that moves me forward in much of what I attempt to accomplish: hope. Hope that others live fulfilling lives without disability, with optimism for all that the future can bring. A special thanks goes out to Dr. Brian Edlow, who, despite having peered at my brain countless times, continues to be a guide and inspiration for much of what I do.